In the period between 2017 and 2018, the Health and Safety Executive (HSE) reported a total of 144 fatal injuries, and 71,062 non-fatal injuries, in the workplace under the RIDDOR procedure. The Reporting of Injuries, Diseases and Dangerous Occurrences Regulations requires both employers, and managers of certain premises, to report work-related accidents and deaths to the relevant authority. According to the HSE, the estimated cost of these workplace injuries was in the region of £5.2 billion. Of the fatal injuries, 35 were attributed to falls from height, and 23 were attributed to strikes by moving objects (including flying/falling objects), accounting for approximately 40% of the cases reported. For the non-fatal injuries, those numbers are 5,445 and 7,024, respectively, accounting for approximately 17.5% of all reported cases. Many of these cases were due to the fact that there were either people or objects at height when something went wrong. According to the Management of Health and Safety at Work Regulations 1999, it is the legal responsibility of an employer to minimise and eliminate as much ‘work at height’ as possible. This is done via implementing the ‘hierarchy of controls’, where putting people at height should be a last resort, as outlined in The Work at Height Regulations 2005. The first requirement is to produce a Lifting Plan. In simple terms, the purpose of a Lifting Plan is to ensure that any lift is properly understood, fully controlled, and executed in a safe manner. Mr Richard Giles-Carlsson, of Hawkins’ Manchester Office, explains the full meaning and purpose of the Lifting Plan in an article that is available on the website here. The purpose of this article will be to take a more focused look at the selection of the appropriate equipment for the lifting operations. The specifics of the equipment may be different, depending on whether the equipment is used as personal protective equipment (PPE), when a person is operating at height, or on whether it is used as lifting equipment, when a person is being lifted as a ‘load’. Person as a ‘load’ within a MEWP. Photo from USAF. There are three main types of lifting sling: synthetic fibre, chain, and wire rope. 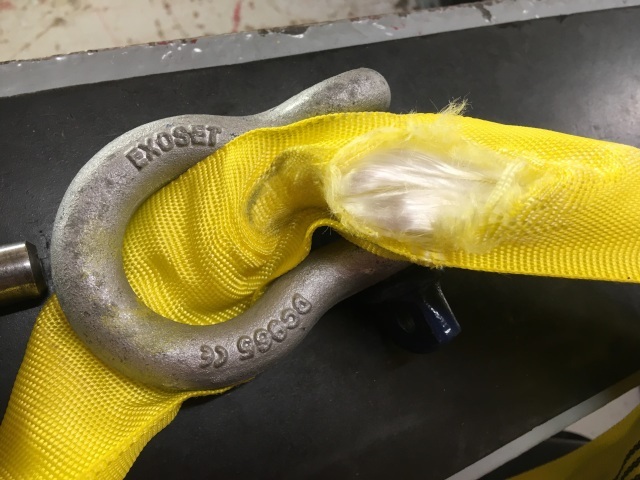 This article will consider both the use and failure of synthetic fibre lifting slings. The exact numbers are not available, but nearly 100% of failures of synthetic fibre slings are due to improper use, rather than manufacturing defects. Synthetic fibre slings can be made from various materials, including polyester (PE), polyamide (PA), and polypropylene (PP). Slings made of these materials can be individually rated between 500 kg and 450 tonnes in a straight lift. Many people do not like to find out that these slings are technically only held together with a small amount of tape. What gives these slings their strength is the friction between the many individual yarns wrapped in a circle. These slings are also manufactured with a built-in factor of safety (FoS) that is normally around 7. A factor of safety indicates the difference between the rated load and the minimum breaking load of the equipment. This means that those 450 tonne rated slings, wouldn’t actually snap in a straight pull until at least 3150 tonnes, or 7 times that of the design load! So clearly those little fibres work. Sharp edges (either part of the load or near the load) are a serious concern in any lifting operation, regardless of the type of sling used. In fact, the definition of a ‘sharp edge’ was originally devised for wire rope. An edge is defined as ‘sharp’ if the edge radius (r) is smaller than the thickness of the sling (d); the thickness of the sling is defined as its thickness under load. However, consideration must also be given to the shape and structure of the edge itself, which may increase the sharpness of the edge. This rule means that an edge may be considered ‘sharp’ even if it’s a perfectly round object. For example, one available type of 100 tonne rated sling has a loaded thickness of approximately 35 mm. This means that any edge with a radius of less than 35 mm would be considered ‘sharp’ - that’s the size of a cricket ball, not something you would normally consider sharp! Hawkins has been conducting independent investigations for nearly 40 years and employs a team of experienced and qualified scientists and engineers. A number of the team are familiar with the different characteristics of lifting procedures, legislation, method, and materials examination in order to determine root cause of failures. Please contact a member of the team to discuss the range of services that we can offer. Tom Post is a qualified and experienced materials and nuclear engineer with extensive experience and qualifications also specific to lifting and height safety equipment across the mountaineering, entertainment, adventure, and industrial environments. This includes being a qualified IRATA Technician, ERCA Ropes Course Inspector, Lyon Anchor Inspector and an experienced Climbing Coach, Aerialist Rigger, and Entertainment Rigger.